As the upper region braces for the drought, Phuket City is working against the clock to prepare for the floods that will likely hit when the rainy season starts in June. Bangkok’s annual celebration of the Thai New Year has garnered the city a reputation for hosting the world’s largest water fight. Only a headlamp helps Wanna Graikoom navigate the darkness in southern Thailand as she works through the night with her husband and son harvesting rubber sap from more than 1,000 trees. Thailand’s general election on March 24 would pave the Southeast Asian nation towards a mature and sustainable democracy. The former members of a dissolved Thai opposition political party said they will carry on trying to block the military government’s effort to retain power in the general election. Thailand is in temporary limbo. The current government, which came to office in May 2014 via the country’s 12th military coup, is in full election mode. A security alert has been issued in this southern border province after seven bombs exploded — and three others were discovered and destroyed — in Pak Phayun district on Sunday morning. A junta-led committee has selected a group of shortlisted candidates for the junta to appoint as unelected senators, a deputy prime minister said Friday. Zheng Jiu arrived at Bangkok’s Suvarnabhumi Airport on Feb. 8 with his mother Ma Daifeng to travel back to China, after spending 1,271 days in Thailand since the Aug. 17, 2015 Bangkok bombing blast. Prime Minister Prayut Chan-o-cha is scheduled to visit four provinces to follow up on government work over the next two weeks, a move that appears to follow the trail of Palang Pracharath Party (PPRP)election campaign rallies which will be held prior to Gen Prayut’s visits. The Thai Raksa Chat Party’s demise is a windfall, especially for Prime Minister Prayut Chan-o-cha, says ISEAS’ Dr Termsak Chalermpalanupap. Eighty-one gamblers, including 25 foreigners, have been arrested during a raid on a gambling den in Lat Krabang district in eastern Bangkok. Over 4,000 Thai nationals working in Malaysia turned up at the Thai embassy in KL yesterday to cast their ballots. The Royal Forest Department on Friday came out to defend the latest cabinet resolution allowing the country’s biggest cement-processing company to continue limestone mining in an ecologically-rich watershed area in Saraburi province. Overseas voters who mailed off ballots for the Thai Raksa Chart Party automatically lost their votes the moment the party was dissolved. The Chart Pattana Party has postponed a major election rally scheduled for March 13 in its stronghold of Nakhon Ratchasima as Prime Minister Prayut Chan-o-cha is scheduled to visit the northeastern province the same day. Last year we explained how Thailand’s Foreigners’ Working Management (No.2) (2018) (ED2), which came into force on 28 March 2018, has significantly liberalized restrictions on foreign workers. Several high-profile incidents of suicide among school and university students over the past two weeks have focused the nation’s attention on a problem that has been worsening, under the radar, for quite some times. After three years of revision, Thailand recently unveiled its updated power development plan (PDP 2018–2037), which explicitly shows the country’s ambition to embrace renewable energy. Thailand is the world’s largest exporter of raw rubber. However, as its global price is plummeting, the country’s farmers are suffering. Security has been stepped up after a series of homemade bombs exploded in Satun and Phatthalung provinces on Saturday night and Sunday morning. Seven explosions were reported late Saturday night and early Sunday morning in Thailand’s southern provinces of Satun and Phatthalung. WITH ATTENTION focused on forest fires’ contribution to the air pollution choking upper Thailand, other outdoor burning – particularly farm scrub being torched – is coming under closer scrutiny. A leading figure in Phuket’s hotel industry in has confirmed that hotels and resorts across the island are starting to feel the effects of low water pressure in their mains water supply, which is forcing some hoteliers to arrange their own water supplies to ensure guests are not affected. The first man-made animal crossing linking two national parks over a highway in Prachin Buri was inaugurated on Saturday in an effort to prevent more animals from the two parks being killed. The 194 senators to be handpicked by the Thailand’s military junta, which is officially known as the National Council for Peace and Order (NCPO), are expected to be dominated by a screening committee and their names are expected to be in the hands of the NCPO today. he dissolution of Thai Raksa Chart Party on Thursday for having nominated Princess Ubolratana as a candidate for prime minister – dragging the royal institution into politics – has left many supporters wondering which party they should they vote for in two weeks time. The Customs Department hopes that Thailand will rise in the World Bank’s Ease of Doing Business rankings after the launch of Pre-Arrival Processing (PAP) e-bill payment and e-customs clearance. Talks between the State Railway of Thailand (SRT) and Charoen Pokphand Group (CP Group) on March 19 will decide whether the consortium will develop a high-speed rail project linking three major airports, Deputy Transport Minister Pailin Chuchottaworn said. Only a headlamp helps Wanna Graikoom navigate the darkness in the southern region as she works through the night with her husband and son harvesting rubber sap from more than 1,000 trees. Democrat party leader Abhisit Vejjajiva made it clear today that he will definitely not support Prayut Chan-o-cha as the post-election prime minister. FOREIGN TOURISTS failed to pay a combined Bt300 million in medical bills after receiving treatment in state hospitals last year, prompting the government to set up claim centres to collect what’s due. More than 100 officials, hotel staff, volunteers and local residents joined a mass cleanup at Kalim Beach yesterday morning (Mar 8) under Patong Municipality’s ‘Aware and Conserve the Environment’ campaign. American contestant Jazell Barbie Royale was crowned “Miss International Queen” in Thailand on Friday at a beauty pageant for transgender women, becoming the first person of color to win the competition since it started in 2004. A taxi driver was fined Friday for charging two passengers 1,800 baht for a short drive from Mo Chit Bus Station to Pathum Thani province. The construction of the Bueng Nong Bon Lake drainage tunnel is expected to be completed in 2021 and will help mitigate flooding in four districts of Bangkok. The Nan “U-Turn of Death”. A fatality almost every day. Thailand’s U-Turns, a favorite traffic mechanism of Thai road planners, are a cause of constant delays, dangerous turns and frequent fatalities. Six home-made bombs exploded at six different spots in Pak Phayun district of this southern province on Sunday morning, but caused no casualties, according to media reports. The interest spread of corporate bond issuance has increased by 0.3-0.5% after a rise in bond supply in the first quarter, says the Thai Bond Market Association (TBMA). Good luck to those who can! In Phuket you can have fantastic experiences that either cost you nothing or not much more. Bangkok -Somwalee Limrachtamorn, the managing director of Nielsen (Thailand), the leading provider of marketing information and consumer-related measurement, has disclosed that the state welfare card scheme, which offers each card holder 200-300 baht a month to buy consumer products and spend on travel expenses, improved the overall growth of consumer spending in last year’s fourth quarter by 3.6 percent, higher than the previous three quarters, she said. 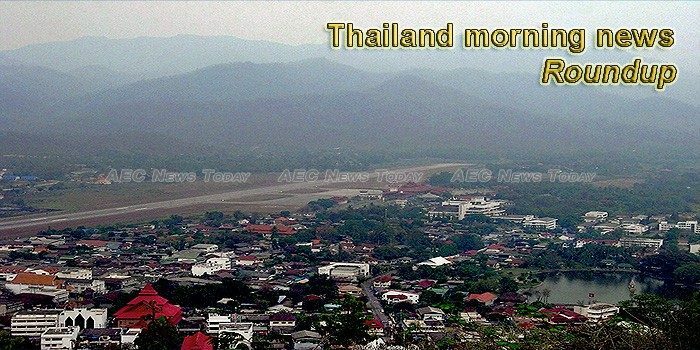 Phuket airport authorities are looking to restrict photography of aircraft from the northern end of Nai Yang beach, at the western end of the single Phuket International Airport runway.